My one month vegan challenge is complete! I thought I’d share my experience and the changes I felt during the month. The first week was definitely the hardest for me. Rather than ease into being vegan I went straight into it and cut out all the non-vegan foods. I think I struggled in the first week since I had the whole ‘want what I can’t have’ thing going on and my sister ordering sushi during the week was tough but after that first week it definitely got easier and I stopped craving meat as much and when cravings did pop up every now and then I was able to nip them in the bud much faster. I found the first two weeks the OH and I had the biggest boost in energy levels. In fairness, I wasn’t working much but the OH was working full-time and he felt he had significantly more energy. I didn’t feel sluggish or bloated after meals which was great. I didn’t realise that was even possible! I figured that feeling was just a normal “full/digestion” feeling. I found a whole new appreciation for vegetables and the natural flavour of veg. I also got an aversion to fizzy drinks and can’t drink them at all now because the sugar is so artificial. I can eat almost a whole head of broccoli in one sitting I love it so much now! Food shopping was much quicker since I could easily eliminate several aisles in the supermarket and couldn’t buy all the junk I usually get since most of it isn’t vegan. Saved myself a whole load of calories. Speaking of which, I signed up for the Operration Transformation and in the first two weeks I lost 2 lbs!! I was so shocked since I was eating crisps after dinner every night and not watching what I was eating or doing any exercise. However then I went and gained 1 lb between last week and this week but with all the fried food I’ve been eating I’m not surprised! Overall I had a net loss of 1 lb which isn’t loads of weight loss but I’m happy with it considering I wasn’t trying to lose weight and went on a weekend trip to London eating out the entire time. My eczema has cleared up a lot and isn’t as itchy as it used to be so I haven’t been scratching it. I’ve been trying to pinpoint what foods trigger any itchiness and I think overly spicy food might be one at the moment. Overall I think the vegan month really helped and it’s almost fully healed now. I’m really glad I took on this ‘challenge’ & learned some food self control! I’m converting to mostly vegan/pescatarian now & limiting meat to sparingly. 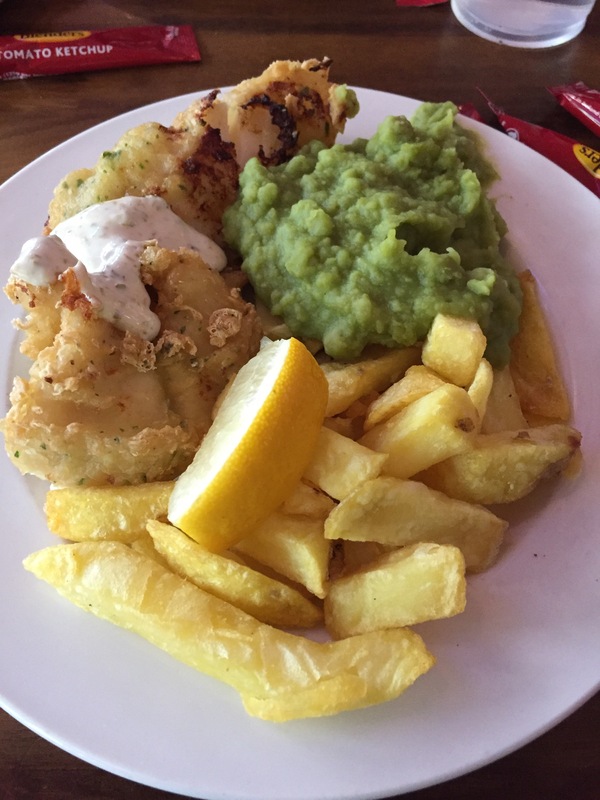 My first non-vegan meal was lunch in College Bar on my last day in the lab of fish & chips with mushy peas.